This diagram presents a model of Alzheimer’s disease. It brings together many facts about Alzheimer’s disease to present a picture of the disease and the context in which it operates. The diagram is intended to help people who are familiar with some aspects of AD have a wider understanding of it. It is also helpful for people who might be learning about Alzheimer’s for the first time. 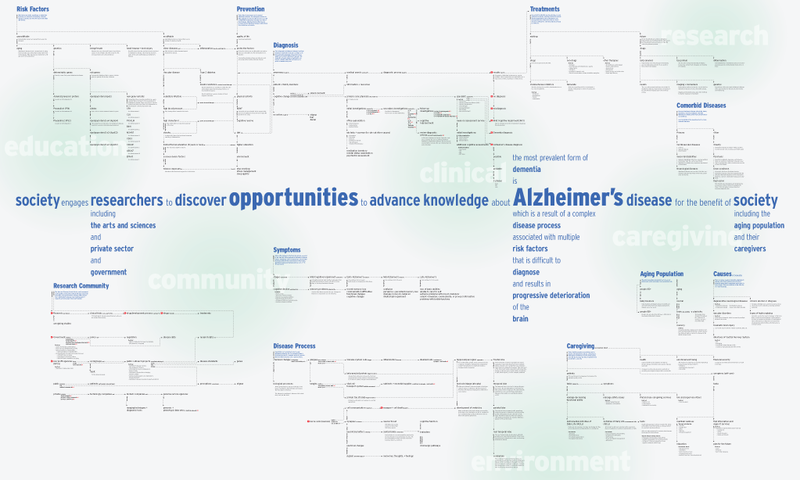 We created the map to start a conversation about design opportunities in the world of Alzheimer’s. The large circles in the diagram—education, community, clinical, environment, caregiving and research—provided jumping off points for brainstorming solutions to AD. Since the map was created in 2011, important new discoveries continue to advance the world’s understanding of the disease. 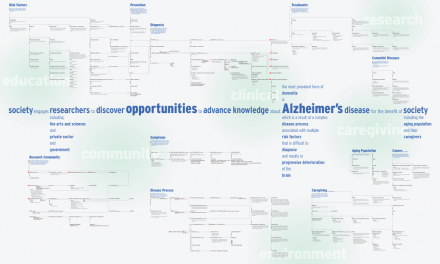 This concept map was co-created by Dubberly Design Office and the Global Strategic Design Office at Johnson & Johnson.